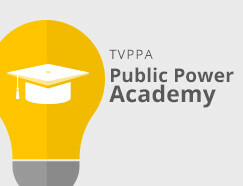 The Tennessee Valley Public Power Association, Inc. (TVPPA) is the nonprofit, regional service organization that represents the interests of consumer-owned electric utilities operating within the Tennessee Valley Authority (TVA) service area. TVPPA members include both municipal and electric cooperatives, and they serve more than 9 million people in Alabama, Georgia, Tennessee, Mississippi, Kentucky, North Carolina and Virginia. Since the mid-1930s, consumer-owned utilities have been major contributors to the quality of life enjoyed by Tennessee Valley residents. Local electric systems are more than utilities — they are an active, necessary part of the communities they serve. The Valley’s consumer-owned power distributors have only one purpose — to provide all ratepayers with the best energy services at the lowest possible cost consistent with sound business practices. We will be the preferred and continuing source of services that enhance the competitive position of consumer-owned utilities. We will be the leading force in shaping public policy related to the supply of electricity to consumers in the Tennessee Valley. Our mission is twofold: to serve as an effective advocate for our members’ interests with the public, in the political process, and with the TVA; and to be a successful independent provider of competitive business services. As a voluntary service organization, we provide our members with the advantages of larger utility operations without relinquishing the local ownership and control that is essential to our independent distribution systems. The backbone of our association is its committee structure. Key volunteer committees provide the vital working link between the association staff and members. Regular TVPPA Members are located in the seven-state TVA service area of Tennessee, Mississippi, Alabama, Georgia, North Carolina, Virginia and Kentucky. We also have more than 100 Associate and Affiliate Members across the nation! For details, see our Member Listings Page.